Click here for sample verses from the version by Benjamin Wilson. Together with Illustrative and Explanatory Foot / Notes and a Copious Selection of References / to the whole of which is added / a valuable alphabetical appendix / by Benjamin Wilson. References: Chamberlin 557-5, Hills see 1792, Herbert see 1950, Taliaferro-BVE CN00130, Taliaferro-EELBV 7480. 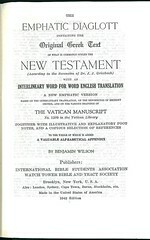 Facsimile: A pdf facsimile of the 1870 edition is available at books.google.com. 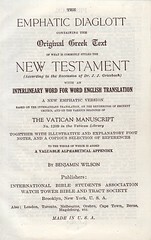 In 1902, the Watchtower Bible and Tract Society obtained the rights and plates for this translation and made it available for a number of years. 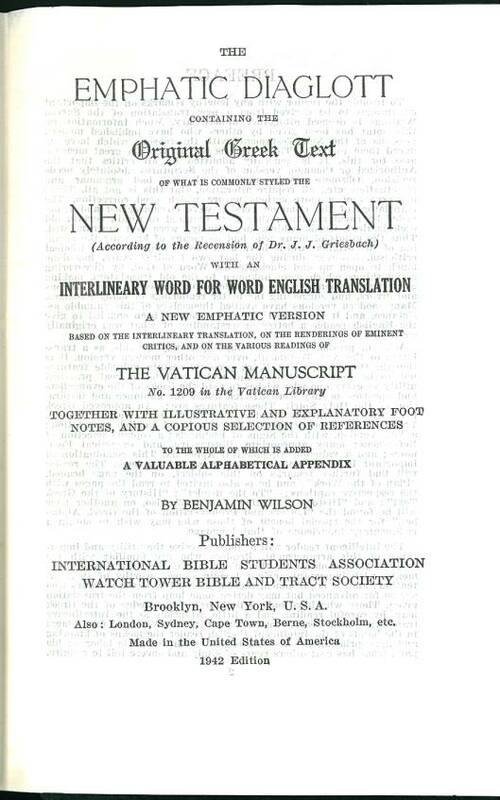 Wilson translates John 1:1 as: "In a beginning was the Word, and the Word was with the God, and a god was the Word." in the interlinear version. His actual translation reads: "In the Beginning was the Logos, and the Logos was with God, and the Logos was God." References: Chamberlin 557-5; Hills see 1792, 2402; Herbert see 1950;Taliaferro-BVE CN00130, Taliaferro-EELBV 7480. Comment: Hardcover, small octavo, 924 & (4) pp. Scripture text in double column: Greek on left, English on right side of each page. alternate readings in footnotes. Undated preface (2 pp) by B. Wilson. 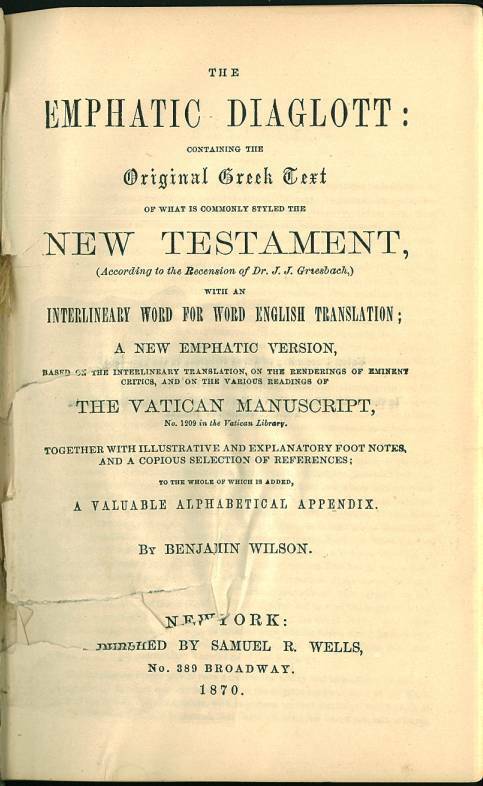 As introductory information on the NT 7 pp: History of the Greek text • History of English Versions • To the Reader • Plan of the Work • Signs of Emphasis • Letters & Pronunciation of the Greek Alphabet • Remarks on Grammar. The Alphabetical Appendix to the NT contains 52 pp. 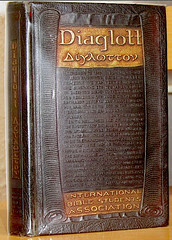 Cover and title from an undated 1940's era copy of Wilson's Diaglott.